In 43 AD, Aulus Plautius led an expedition of four legions to Britain. His army advanced with only minor skirmishing as far as Rutupiae on the coast of Kent. Late in the season, Roman scouts finally found the enemy camped on the northern bank of the River Medway. 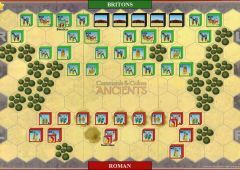 Togodumnus and Caratacus, the commanders of the Briton tribes, believed the river would halt the Roman advance. They were taken by surprise when a force of specially trained auxiliaries (described as “Celtic” in one account) swam the river and attacked the British charioteers. 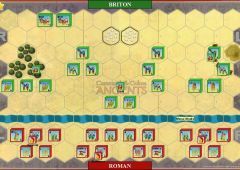 The Britons, while preoccupied with the auxiliaries, were again surprised when Legion II Augusta, under Vespasian suddenly crossed the river (probably using a pontoon bridge) and established a second bridgehead. 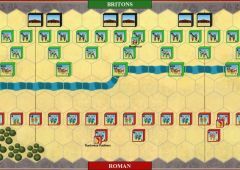 The remaining legions began crossing to reinforce Legion II Augusta. 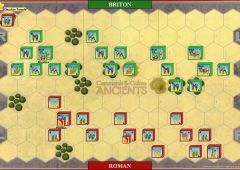 During the night, the Britons turned all their strength on the legions, knowing they were the bigger threat. 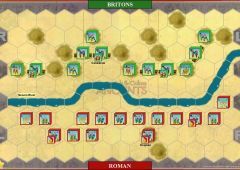 The Briton assault penetrated the Roman lines, putting the bridgehead in great danger. Just then, Hosidius Geta led a legion that had just crossed the river in daring counter attack. 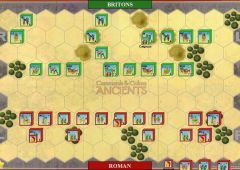 Geta’s force broke through the enemy’s line and saved the bridgehead (which earned him a “triumph,” very unusual for someone not a consul). The defeated Britons disengaged and withdrew back to the Thames. To determine which side will Move First , both players will roll dice equal to their command. The player that rolls the most Leader symbols will Move First . If a tie results, roll again. The river is only fordable by light foot units. Other troops treat is as impassable terrain for movement and in retreat. Use standard Bridge rules for the pontoon bridge. 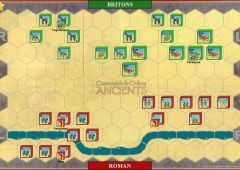 (Note: the bridge is under a Roman Medium Infantry unit on the river at the start).